Today, Microsoft announced the release of their Azure Stack offering. If you are not familiar with this offering, think of it as “Azure services running on-premises.” Azure Stack gets installed in your data center or offered up by a service provider for you to consume. The release of Azure Stack has been a long while coming as it was first announced in late 2015. A Walk Down Memory Lane.. Remember those days when you needed to spin up a VM to test something? There wasn’t a lot of choices. You had to either reach out to IT to request that they spin up a VM for you and provide you access, or you could spin one up on your laptop using a type 2 hypervisor which had its limitations. Typically, this had to go through an approval process that sometimes took weeks. For those of you graybeards, who have been around the industry as long as I have, you didn’t even have the luxury of virtualization and you had to request a server. How did we ever get anything done back then? Not so long ago companies like Amazon, Microsoft, and Google started to offer up hyperscale environments where you could allocate resources and pay for them as you use them. The sheer size of these environments allowed them to offer these resources at a low price point. This allowed companies to move from a CAPEX to an OPEX model which started the evolution of the public cloud. However, there are many companies that have either security concerns or compliance requirements that keep them from taking advantage of the public cloud and all it has to offer or those who wish to have complete control of their data and resources. Enter the private cloud, hosted in your datacenter or a service provider’s datacenter. Companies must evolve and to stay relevant in the industry they need to focus on providing value to their customers. In the case of the private cloud, those customers could be your own internal business units. These BUs need the capability to have self-service deployment and agility. Prior to Azure Stack there was Azure Pack which provided these capabilities. This was a big step in the right direction as it provided a lot of these capabilities but there was something missing. What if you had a workload running on Azure Pack and you wanted to be able to run it in public Azure without having to make any changes? This was not easily done as the APIs were not consistent. Microsoft Azure had already seen so much growth that a new user experience was in order which gave Microsoft a chance to build a new portal and a new deployment model (resource manager). This left a lot of users in a state of confusion having to keep up with learning and supporting both. 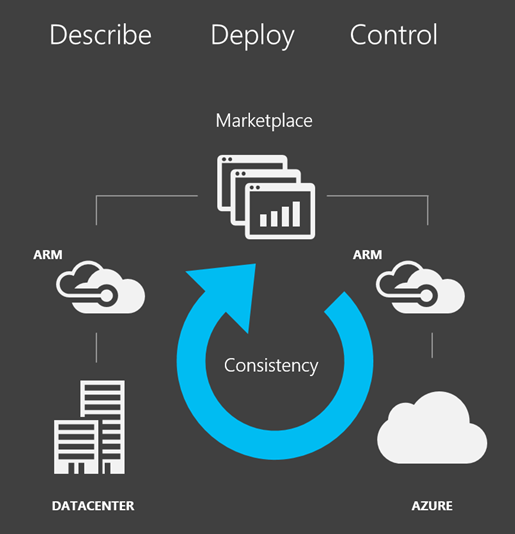 Now that Azure Stack has been developed, you get consistency across both private and public clouds. The APIs are consistent, the deployment models are consistent, and the user experience is consistent. Users can now log in with the same identities utilizing ADFS or Azure AD. Developers can use the same tools that they are familiar with. Think of Azure Stack as being an extension of Azure bringing agility and faster innovation to cloud computing, all behind your firewall. This allows for a true hybrid cloud experience. Purchasing, Licensing, Pricing , Support, and Roadmap..
Azure Stack is available for purchase for September delivery through three hardware vendors, Dell EMC, HPE, and Lenovo on pre-qualified hardware. Azure Stack is initially available in 46 countries. It will be delivered as an integrated system, with software pre-installed. Cisco and Huawei recently announced they will be joining the other three hardware manufacturers. Expect to see their offerings made available soon. To help developers get started, Microsoft also announced the Azure Stack Development Kit (ASDK). This kit is the free, single server deployment of Azure Stack. This will allow you to start your development work right away. Make sure you follow the hardware and deployment requirements. The software licensing will be available via EA and CSP for the pay-as-you-use package. If you have an existing EA Azure subscription, you can use that same one for consuming Azure Stack. CSP providers will be able to use the same tenant subscriptions for customers as well. MSDN, Free trials, and Biz Spark offers cannot be used with Azure Stack. You will be able to use on-premises Windows Server and SQL Server license with Azure Stack as long as you comply with product licensing. If you BYOL you will only be charged for consumption on the base VM. Azure Stack services will be priced the same as Azure, on a pay-as-you-use model. The following services will be charged on a consumption basis: Virtual Machines, Azure Storage, App Service, Azure Functions, Azure Service Fabric (CY18), and Azure Container Service (CY18). You will be billed for Azure Stack usage as part of your regular Azure invoice. For those operating in a “disconnected mode” (unable to transmit metering information), a capacity model pricing package is available. This is an annual subscription based on a fixed fee on the number of physical cores in the system. Note: You are not charged for the virtual machines and software required to power the Azure Stack infrastructure. With Azure Stack, there will be two support contracts, one purchased from the hardware vendor and one from Microsoft. For those customers who have an existing Premiere or Azure support contract with Microsoft today, it will cover Azure Stack as well. Initially the Azure Stack offering footprint will be a minimum 4 servers and a max of 12, with 1 scale unit per region across a single region. A scale unit is a set of servers with identical CPU, memory, network, and storage configuration. Each scale unit may differ. One or more scale units make up a region. Multiple regions make up a cloud. See the following table for features that will be delivered after initial release. Azure Stack brings purpose-built integrated systems to your data center that allows speed and agility to help you modernize your applications across a hybrid environment. It allows developers to build applications using a consistent set of services, tools and processes. Operations is now able to deploy to the location that meets the needs of their business, meeting technical and regulatory requirements, all while paying only for what you use. 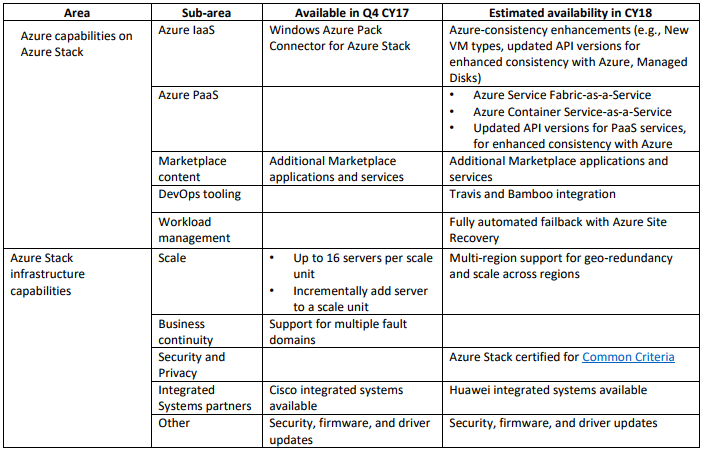 For additional information on Azure Stack refer to this link. 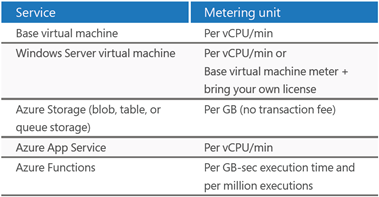 Were you aware that Microsoft Azure offers single Instance Virtual Machine SLA? SLA stands for service level agreement which is a contract between you, the end user, and Microsoft wherein a level of service is expected. If a specified level of service is not provided, the end user may claim a financial credit. Yes, that’s right, Microsoft Azure now offers single instance VM SLA as long as you use premium storage for the OS disk and data disks. Microsoft guarantees you will have VM connectivity of at least 99.9% of the time. This equates to about 43 mins per month of potential unavailability. You may ask, “Why would I want to deploy a single instance VM?” In many situations a customer may have an application that is not built for scaling out. Or scaling out could be cost prohibitive for the application and the customer is fine with running their application in a single VM. In fact, many customers are used to deploying single VMs in their data center and taking advantage of live migration or vMotion. However, when you operate in the cloud you need to think differently to obtain high availability. If high availability and a higher level SLA is needed, then you should deploy at least 2 VMs into an availability set. This will provide you with 99.95% uptime guarantee. An availability set is a logical grouping of VMs that spans across fault and update domains. In the event of a planned maintenance event or an unplanned event, at least 1 VM will remain running. This is due to hardware clusters in Azure being divided into update and fault domains. These domains are defined by hosts that share a common update cycle or physical infrastructure. In addition, these clusters support a range of VM sizes. When the first VM of an availability set is deployed, the hardware cluster is chosen based on the supported VMs. By default availability sets are configured with 5 update domains (configurable to 20) and 3 fault domains. If you are still using VMs with unmanaged disks (traditional storage), it is recommended to convert those VMs to use Managed Disks. If you are not familiar with Managed Disks, stay tuned as I will be talking about these in a future blog post. Recently Microsoft added a feature that I requested in early 2016. Back then I would hear from customers about failed deployments to find out that it was the limitation on the core count. All they needed to do was to open a ticket to request a core quota increase. The problem comes when someone else had increased the quota already so you had no idea what the actual limit was at that point in time. Eventually Microsoft exposed the current quota for cores in the portal when submitting a ticket for a quota increase. That was better but we still needed to see more info. Recently Microsoft added the capability to see Azure Usage and Quotas. You can see this by opening the Subscriptions blade, select a subscription and click on Usage + Quotas. You can also get to the same place through the Billing feature which is still in Preview at the time of this writing. Here you can see a few quotas listed with the usage. Only a small subset are listed today but expect to see more added soon. There is also an integrated support experience from within this blade to allow you to request an increase. Note: Core quotas are per region accessible by your subscription. So you would need to request an increase based on the region you are deploying into as well as the size of VM series. Free Trial subscriptions are not eligible for limit or quota increases. You will need to upgrade to a PAYG subscription. For a complete listing of all the subscription and service limitations, quotas and constraints, go to this link. This summer Microsoft is expected to go GA with their Azure Stack offering. If you are not familiar with this, think of it as “Azure in a box”. This would get installed in your datacenter or offered up by a service provider for you to consume. The release of Azure Stack has been a long while coming as it was first announced in late 2015. Currently Technical Preview 3 (TP3) is available for evaluation so some of this info could change. Everything that I am about to talk about is publicly available on Microsoft’s website. Remember those days when you needed to spin up a VM to test something. There wasn’t a lot of choices. You had to either reach out to IT to request that they spin up a VM for you and provide you access, or you could spin one up on your laptop using a type 2 hypervisor which had its limitations. Typically, this had to go through an approval process that sometimes took weeks. For those of you graybeards, who have been around the industry as long as I have, you didn’t even have the luxury of virtualization and you had to request a server. How did we ever get anything done back then? Not so long ago companies like Amazon, Microsoft, and Google started to offer up hyperscale environments where you could allocate resources and pay for them as you use them. The sheer size of these environments allowed them to offer these resources at a low-price point. This allowed companies to move from a CAPEX to an OPEX model which started the evolution of the public cloud. However, there are many companies that have either security concerns or compliance requirements that keep them from taking advantage of the public cloud and all it has to offer or those who wish to have complete control of their data and resources. Prior to Azure Stack there was Azure Pack which provided these capabilities. This was a big step in the right direction as it provided a lot of these capabilities but there was something missing. What if you had a workload running on Azure Pack and you wanted to be able to run it in public Azure without having to make any changes. This was not easily done as the APIs were not consistent. Microsoft Azure had already seen so much growth that a new user experience was in order which gave Microsoft a chance to build a new portal and a new deployment model (resource manager). This left a lot of users in a state of confusion having to keep up with learning and supporting both. Purchasing, Licensing, Pricing and Support..
At GA, Azure Stack is going to be available through three hardware vendors, Dell EMC, HPE, and Lenovo on preapproved hardware, delivered as an integrated system, with software preinstalled. Cisco recently announced they will be joining the other three hardware manufacturers. Expect to see their offering soon after GA. I wouldn’t be surprised to see other manufacturers jump in on this as well. The software licensing will be available via EA and CSP only. If you have an existing EA Azure subscription, you can use that same one for consuming Azure Stack. CSP providers will be able to use the same tenant subscriptions for customers as well. MSDN, Free trials, and Biz Spark offers cannot be used with Azure Stack. You will be able to use on-premises Windows Server and SQL Server license with Azure Stack as long as you comply with product licensing. If you BYOL you will only be charged for consumption on the base VM. Azure Stack services will be priced the same as Azure, on a pay-as-you-use model. At GA, the following services will be charged on a consumption basis: Virtual Machines, Azure Storage, App Service, and Azure Functions. You will be billed for Azure Stack usage as part of your regular Azure invoice. See below chart for how those services will be metered. Azure stack brings purpose-built integrated systems to your datacenter that allows speed and agility to help you modernize your applications across a hybrid environment. It allows developers to build applications using a consistent set of services, tools, and processes. Operations is now able to deploy to the location that meets the needs of their business meeting technical and regulatory requirements, all while paying only for what you use. Like a lot of you out there, I received an Echo Tap from my daughter for Christmas. The funny thing is I had the same idea as a gift and bought the Echo for my wife and grandkids. I also received the Echo Dot through my company. Needless to say, Alexa is all over my house. For those of you who are not familiar, Alexa is the wake word. This triggers the Echo to listen to your command. Immediately after doing a little research to see what Alexa was capable of, I noticed there were skills that you could enable for further functionality. As I have a passion for learning new things, I thought how cool it would be if I could build my own Alexa skill. What if Alexa could help me study for an exam? Well, now she can. As my focus is on cloud technologies, I searched through the skills library to see if I could find anything around Azure and AWS. It turns out that there were a couple around AWS but nothing around Microsoft, specifically Azure. So I knew what my next project was going to be. I did a little research and found some guidance around building your own Alexa skills app, based on the trivia framework. The really cool thing about this is I could use the AWS Lambda service which allows you to run code in the cloud without having to worry about deploying or managing the servers. If the traffic to my skill all of the sudden ramps up, the service will scale out as needed and when the traffic slows it will scale back in. This is what is referred to as “Serverless Computing”. You mean I can run code in the cloud without having to worry about the server or the infrastructure, it scales as needed and its highly available? The answer is Yes. This is a very powerful service which I feel is going to get a lot of attention moving forward. I simply created a Lambda function in AWS, added my code, set the configuration and added a trigger for the Alexa Skills Kit. I then logged into the developer console and opened the Alexa Skills Kit where I defined my skill. This included providing skill information, defining the interaction model, setting the configuration using my newly created Lambda function ARN (amazon resource name), configuring the publishing information, and specifying the privacy and compliance. The capability exists within the developer portal to be able to test and validate as well. Once my skill was tested and validated I submitted it for certification. The certification process can take up to 7 days to go through testing at AWS to ensure you have met security requirements and the functional and user experience passes. If your skill doesn’t meet the criteria you will be notified and asked to resolve the issues and resubmit. Make sure you do not infringe on anyone’s intellectual property. My Alexa skill is based on studying for the 70-533 Azure Infrastructure exam. I was excited to receive an email that my skill has been certified and has been published to the skill store. I encourage you to check it out and please rate it or provide a review. The name of my skill is “Azure Quiz Buddy” and you can search for it or locate it under the Education and Reference category. I hope you will enjoy my new Alexa skill and be inspired to go and build your own.